KIM LAWTON, correspondent: This is Coventry Cathedral in the British West Midlands. One end is the open-aired shell of a 14th Century Gothic Church that was bombed during World War Two. Attached to that is a contemporary structure, Britain’s first modernist cathedral. For many around the world, Coventry—in both its building and its ministry—is an enduring testament to peace, reconciliation and hope, even in the darkest times. DEAN JOHN WITCOMBE (Coventry Cathedral): What it’s really saying is, essentially, no matter how bad it gets, there’s always a future. LAWTON: Coventry’s history stretches back to the 11th century, when Lady Godiva and her husband Leofric funded a Benedictine monastery here. The magnificent St. Michael’s cathedral was built in the 13-and 1400’s. And there it stood, until the night of November 14th, 1940, when the area was targeted in a bombing blitz by the German Luftwaffe. WITCOMBE: A huge air raid in which over 600 planes came and crisscrossed the city with the deliberate intent of wiping out the whole of the center of the city of Coventry. And very tragically on that night the cathedral went up in flames. LAWTON: The outer walls of the cathedral and its towering spire—the third tallest in England—were all that survived. 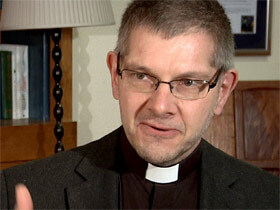 Reverend John Witcombe is the current dean of the cathedral. He says when the raid was over, the dean at the time, Provost Richard Howard surveyed the destruction and was devastated by the piles of rubble that were once his beloved cathedral. Howard wrote the words “Father Forgive” on the charred walls of the sanctuary. LAWTON: As they examined the rubble, church officials saw two burned beams that had fallen in the shape of a cross. They tied the beams together and mounted them where the altar had stood. They also saw that the site was filled with long medieval nails. 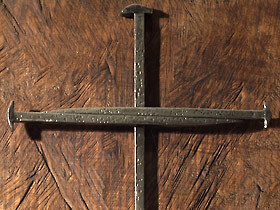 A local priest fashioned three of the nails into a cross, which would become the symbol for Coventry. Howard vowed to rebuild the cathedral. He also vowed to seek peace and reconciliation, rather than revenge. WITCOMBE: It was deeply controversial. And indeed, in truth, it still is. LAWTON: After the war, Coventry representatives took crosses made from the nails to Germany and began projects to promote healing and reconciliation. WITCOMBE: Some students went from Coventry out to Dresden where, of course, they’d experienced similar, actually greater, devastation to what we had in Coventry, to help rebuild one of the hospitals, the Deaconess Hospital in Dresden. CANON DAVID PORTER (Coventry Cathedral): The fact that we were able to reach out to Germany with such empathy for the suffering of the German people in the cities is a very powerful story and over the decades that story has attracted many people who carry their own wounds of conflict and of division. LAWTON: Canon David Porter leads Coventry’s reconciliation ministry, the Community of the Cross of Nails, which today includes some 160 centers in 30 different countries. The mission is to encourage dialogue, justice and peace. PORTER: At its heart is the challenge to heal the wounds of history, wounds of conflict, wounds of division, North-south, poverty, rich, poor, but—and that still remains a big part of what many of its partners do—but also it’s about learning to live with difference and to celebrate the diversity that is built into our human relationships. LAWTON: The work comes out of the Anglican tradition, but goes well beyond that. 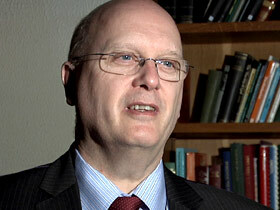 WITCOMBE: We say that’s about building the Kingdom of God, but it’s not just for people of faith and religion. That I think is really important. We can all be working for peace, whatever faith, or, or sometimes if no faith at all. LAWTON: The cathedral took 22 years to rebuild. Church officials selected a design that incorporated the ruins, which can be seen through an etched glass window at the rear of the new sanctuary. In the front, looming above a cross of nails at the altar, is a 72-foot-tall tapestry of Jesus. WITCOMBE: There’s a journey that takes you from the devastation and destruction of the ruins through into the rear of the new cathedral where you immediately find yourself looking up at the great tapestry. You get this tremendous vision into heaven with this huge figure of Jesus, in Glory, seated on a throne. 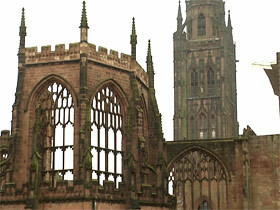 LAWTON: Coventry officials say that’s the ultimate symbol of their faith. WITCOMBE: Your life may feel like the ruins of the old cathedral. Your world, our world, feels like the ruins of the old cathedral, but actually that’s not where God leaves the story. He actually takes us from that place into a new place. LAWTON: I’m Kim Lawton in Coventry, England.